Here are just a few ideas to teach your horse to cross water. After all: Summer starts this weekend and if you love trail riding or Horse Agility you might come across water. How you start depends on how your horse feels about water, his experience with previous water crossings (previous owners might have tried it) and his character. Start making a training plan. This plan is a guideline of ideas, it is not a manual. – crossing water in hand. What kind of “water” do I want my horse to cross? A puddle in the arena or on a trail? A river? A water obstacle in a horse agility course? A lake? Or do I want my horse to enter the sea? What skills does my horse needs to have to make it easier? In this example it would help if my horse is not afraid of water and is already comfortable getting his feet wet. If that is not the case then the first training step can be teaching your horse to stand in a bucket of cold water with one foot. Once he is comfortable with getting his feet wet you can practice hosing his legs off. Open your mind and try to see “all water” as potential training opportunities. Once your horse knows stepping in a puddle can earn him a reward, his ideas about water can change completely. If you start with the criterion ‘Horse puts his left foot in a bucket of water without hesitation’ you can raise it after he has done it three times. Then you can train his other foot. Start at the beginning again with the other hoof because this hoof is a context shift for him. Maybe he is more comfortable because he knows the drill now, maybe this is such a context shift that in his mind it is something completely new. The horse will tell you and over time you will become more and more accurate in predicting his reactions. Your training journal helps you to keep track of changes in your horse. It is so much fun to keep a journal when you train behaviours that are completely new to your horse. You get used to his new skills easily, but if you have a photo album with pictures of each victory you accomplished together you have a wonderful reminder of your journey with your horse. 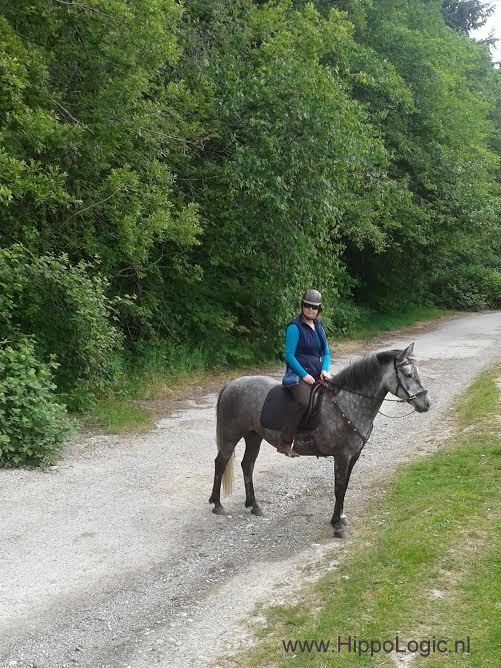 Today my barn friend took me and Kyra to the forest for a trail ride, here in BC, Canada. All went well and I realized that it took me many tiny training steps to turn my 11 months old feral filly into this reliable non spooking trail horse I have today. I had to tame Kyra first, since she was born in a nature reserve and was not imprinted on humans and things like stalls, paddocks, all the sounds in a barn and so on. Then I had to teach her some basic skills like haltering and leading. When she was about two years old I started very slowly on her education on the long reins. When she was four years old I started her under saddle. By then she already knew the basic commands walk, trot, canter, halt and she could make left and right turns. to race through them to make the time they are vulnerable as short as possible. This can be dangerous if the horse doesn’t take into account that your legs make him wider. On our trail ride we encountered several squeezes: gates that enclose the road with big boulders next to it to prevent cars from passing. Sometimes there was also a road sign next to it. That can be dangerous if your horse spooks and it hits you right in the face. Getting your horse used to fly spray is also very useful in the woods here. 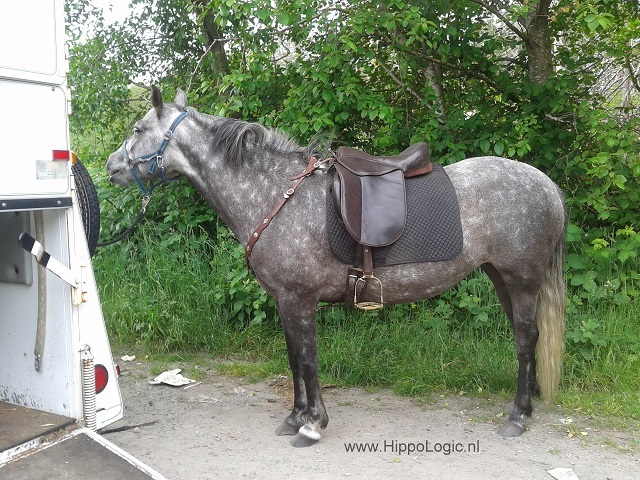 We take the trailer to get to the forest, so in our case trailer loading is also a part of trail riding for us.